In Part 2, we’ll see what can be done for people who cannot keep a Possession of Marijuana Charge off of their Record because of a prior Drug Crime, and we’ll look at a different option to keep a Marijuana Charge (or pretty much any Drug Crime) off of a person’s Record, if the Offense occurred before their 21st birthday. In addition, we’ll examine how to do “Damage Control” for those people who are facing the Charges of Possession with Intent to Deliver, and Delivery and Manufacture of Marijuana. Again, the same “disclaimer” from Part 1 applies here: I am a Criminal Defense Attorney whose office is in Mt. Clemens, and, as such, my Practice and experience (and therefore first-hand knowledge) in these matters is limited to handling cases in Macomb, Oakland and Wayne Counties. If your case is not being heard in the Metro-Detroit area, then the information provided in this article might not accurately describie how things are done where your case is pending. As we learned in Part 1, a “7411” is only available to someone with no prior Drug Record. If a person has a prior 7411, or any prior Drug Crime which was placed upon their Record, then they cannot have any subsequent Drug Charge (and Possession of Marijuana is a Drug Crime) deferred under section 7411. The old saying is that “you get 1 bite at the apple,” and it holds true in the Law generally, and with Drug Crimes in particular. Assuming a new Marijuana Charge is not likely to be dismissed or “beat” at Trial, a person who was over 21 at the time of the Offense, and who is otherwise ineligible for a 7411 deferral, must accept the fact that keeping a new Marijuana Charge off of their Record cannot be done. Instead, the focus for the me, at least, as the person’s Defense Lawyer, shifts to seriously avoiding as many of the penalties as possible that a Marijuana Charge brings. In cases where a person has a prior Drug Crime on their Record, and then picks up a subsequent Possession of Marijuana Charge, the goal of the Defense Lawyer moves from keeping it off their Record to minimizing all the negative consequences possible and, most importantly, to keeping them out of Jail. This is really a long-winded way of saying the focus shifts to “full-blown Damage Control.” Of course, the first thing any Lawyer looks for is a way to beat the case. In truth, however, getting cases dismissed is far more the exception rather than the rule. When an analysis of the facts and circumstances surrounding a Marijuana Charge (or any other Charge, for that matter) lead one to conclude that the charge is likely to “stick,” then minimizing all the negative consequences for the Client becomes the first order of business. Minimizing those consequences requires a case-by-case evaluation. This is not some fancy Lawyer-talk way of blowing hot air. This is a way of saying that a Lawyer’s experience should, for example, include knowing how any particular Court and Judge handles a Marijuana Case (or for that matter, any other kind of case). Depending on which Court (and that literally means which particular Judge) will be hearing the case, an experienced Defense Lawyer may do or not do some things in one case that would be done differently in a case pending somewhere else. Without being too specific, a now-retired Judge in the Tri-County area was known as being very fair and forgiving in almost all of the cases that came before him. For whatever reason, however, he seemed to have a “thing” about Marijuana Cases. Handling a Marijuana Case in front of him was a lot different than handling one in front of another Judge only a few miles down the road. Someone who was not familiar with his “thing” for Marijuana cases would certainly be surprised by the way he handled those cases. Local Lawyers, however, who had the benefit of standing before this Judge on a regular basis, knew all about his perspective on Marijuana cases and would prepare their Cases and Clients assigned to this Judge much differently than they would for a Marijuana Case being heard anywhere else in the Tri-County area. For those who are under 21 at the time of a Possession of Marijuana Charge (actually, from the time of the actual Offense), they can have the matter kept off of their record (in a manner similar to 7411) under a provision of the Law called a HYTA (which stands for Holmes Youthful Trainee Act). This provision of the law can, at least in theory, even keep a second Drug Crime off their Record even if they’ve already used a 7411 to keep a Prior Drug charge off. Since the granting of HYTA is also a discretionary remedy, meaning that it’s up to the Judge, it shouldn’t come as a surprise that a person who has already used a 7411 might well be denied HYTA status by the Judge for a second Drug Crime, especially one so early in life. Since HTYA only applies to crimes that occur before a person’s 21st birthday, while 7411 has no age limit, an astute Criminal Lawyer will always try to use HTYA to keep a first Drug Crime off a person’s record, thus leaving the 7411 available if the person finds him or her self facing another Drug Charge some years down the road. Possession with Intent to Deliver (“P-WID”) cases most often involve, short of beating the whole case, getting the Charge reduced to simple Possession. In those cases where there is no prior Drug Record, a 7411 deal can then usually worked out. If it cannot, for whatever reason(s), managing the consequences of a simple Possession case is still easier than dealing with the Felony consequences of the “P-WID” Charge. “P-WID” cases must be examined on a case-by-case basis. Of course, that’s exactly what the Prosecutor would say, as well, but the difference is one of perspective. The Prosecutor and the Defense Lawyer approach a case from exact opposite sides, much like a Hockey Game where each team has the exact opposite goal from the other side. Whether and how a “P-WID” case can be bargained down to a simple possession is often a matter of degree. In other words, a person found with 20 $5 bags of Marijuana is going to have a higher degree of difficulty getting his or her “P-WID” Charge reduced to simple Possession than a person found with a 1/2 ounce all in one bag. Even in cases where the “P-WID” Charge cannot be beaten or bargained down, the Defense Lawyer’s job centers around Damage Control. The first order or business is, of course, handling the matter so that the Client is kept out of Jail. Once that goal appears to have bee reached, avoiding as many of the other negative (or punitive) consequences that go along with the “P-WID” Charge follows. While each case is different, certain general things apply in all cases. As we mentioned, staying out of Jail is pretty much everyone’s first concern. Beyond that, I will direct my efforts, as a Criminal Lawyer, to keeping the Probation to as short a duration (like 1 year, as opposed to 3 years) as possible. Likewise, I’ll position my Client to avoid any, or at least as many Counseling Programs and Classes, as possible. In addition, I’ll try to get the Client’s Driver’s License reinstated as soon as possible, and try to have that done without the further expense and hardship of a subsequent Court Hearing to do it. Delivery and Manufacture Charges likewise focus the Defense Lawyer’s efforts on Damage Control. Keeping the Client out of Jail is always the first priority, and once that looks to be pretty well taken care of, making sure they don’t wind up on the Probation-from-Hell becomes the next order of business. The other considerations outlined above as we discussed the “P-WID” also apply in equal measure to outright Delivery Charges. Perhaps the most intriguing part of Delivery Cases is that very often, the Defendant is approached by the Police about “giving up” supply sources. While a discussion of that very subject alone could fill as many volumes as an encyclopedia set, I believe such issues are best discussed in private, with a Criminal Defense Lawyer both experienced in that kind of Case and who would be considered “local” in the Court where the Case is pending. Any more than the Police provide insight to how they do undercover operations online, any discussion of the considerations a Defendant has about “rolling over” should always be done confidentially and privately. As I noted before, each case is unique. From my point of view, the first thing I want to know is where the case is being heard (i.e., in what City did the Offense occur)? Next, I’ll want to know if the person has any prior Drug Record. Then, I’ll want to know if they have any kind of prior Record for anything else. Is the person currently on Probation? If so, where? What happened that led to this Charge? 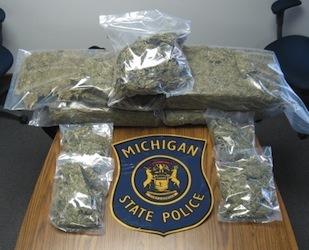 Is this a Possession of Marijuana Charge that is the result of a Traffic Stop? Based upon the facts I learn, I can usually provide the Client with a pretty good idea of how the case will play out.